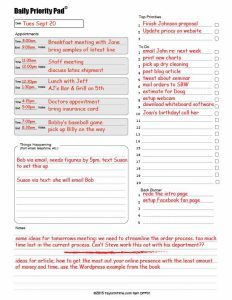 In this digital age of speed, change is taking place so rapidly, we have to spend more time planning and less time working from a traditional “To do” list in order to survive. Planning could be seen as bringing the future into the present where you are able to change its outcome. Use the analogy of driving to work through traffic. You don’t know what the holdup is ahead; you only know that you have come to a standstill. And your focus is on inching forward one car length at a time. But if I were to take you up in a helicopter so you could see for miles ahead, you would know that there is a major accident six blocks down the road, and that you could easily avoid it by making a right turn just ahead and traveling along a parallel street. Seeing the future that awaits you allows you to make adjustments in the present. Similarly, in business and in life in general, you must see beyond your daily “To Do” list and weekly schedules and get a glimpse of the future and how you can best adjust and prepare now for what lies ahead. I refer to this as “helicopter planning” – rising above the busyness of each day and spending a portion of your time visualizing and planning for the future. I use the analogy of a helicopter because it can rise straight up, getting some space between you and the current situation, and it can hover so you have a good view of what’s happening right now, while looking ahead to see what the situation will be further down the road if you continue doing what you are doing. Today, you need the information, knowledge and wisdom of others more than ever. If you are a one-person business, the least you should do is block off a half day each week or two – dedicated to business planning. This is the time when you’re no longer working in the business, but on the business. Since Tuesday is considered to be the most productive day of the week, you might want to leave that time to work on the plan that you develop. You might consider a Friday morning, for your helicopter planning. Or you could make it a Saturday morning if necessary. You might recruit two or three retired businesspeople to serve as an advisory board. There are probably more than enough people who would gladly volunteer their services. 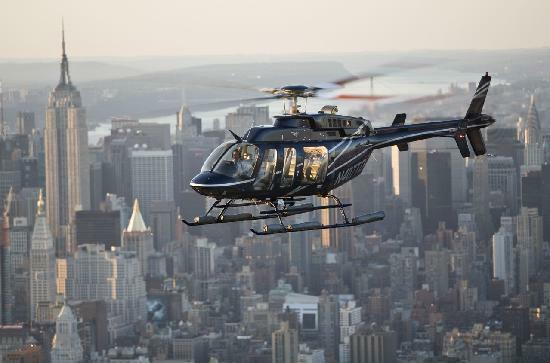 All successful business owners need to get out of their daily grind and find time for helicopter planning. If you are not in business, you can still use the same concept for your personal life. In this case you would involve your family as well. In these planning sessions you might focus on areas of the business that are critical to making it to next month, the next quarter and beyond. You will have to decide which three or four priorities take precedence over everything else. These might include such things as managing cash flow, focusing on customers and quality service, and accelerating revenue growth. For personal planning, it might involve your career, financial status, self-development, family vacation, and so on. Be sure to relate the 80-20 rule to your business. Do 80% of the new customers come from 20% of the things you do to get them? Is 80% of the new business obtained from 20% of your salesforce? Is 80% of the revenue derived from 20% of your product line or services? Do 80% of the activities consume 80% of the time? And so on. Then plan what actions you will take to maximize your return on invested money, time and talent. Change is occurring so rapidly, long-range planning is shrinking in length. We used to think of long-range planning as being 10 or more years, medium-range being five or more years and short-range being one year or more. Now you could consider five years long-range, and six months or less, short-range. That’s about the time it takes Apple to come out with a new iPhone. 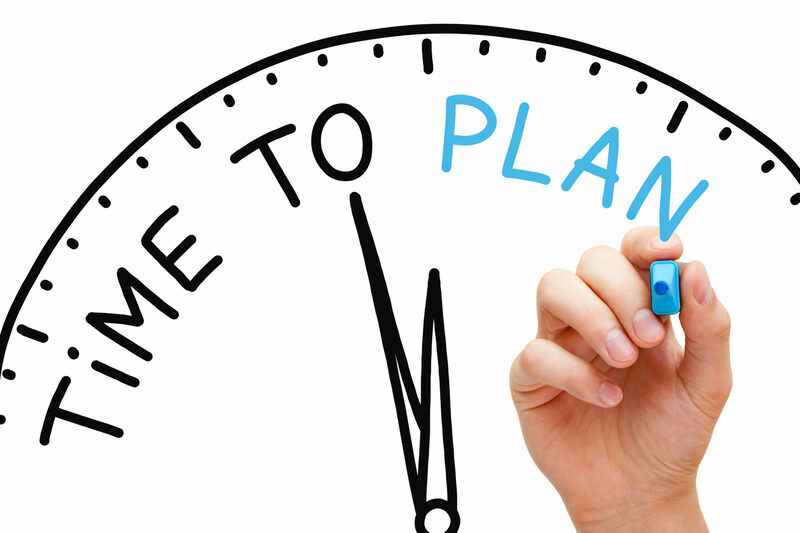 Planning is an ongoing activity essential to the survival and success of your business. Increasing your commitment to get things done. Research has discovered that deciding in advance when you will do something increases your commitment to do it. Adding something to a weekly list of things to do – even though they are only intentions – is better than simply being aware that something has to be done. But even more effective is to choose the specific time during the week that you plan to do something, and then block off that time in your planner as an “appointment with yourself.” Then you have a true commitment to get it done. The problem is that you probably have more things to do during the week than you have the time in which to do them, plus you also can expect a series of unplanned interruptions and crises to disrupt your commitment even more. 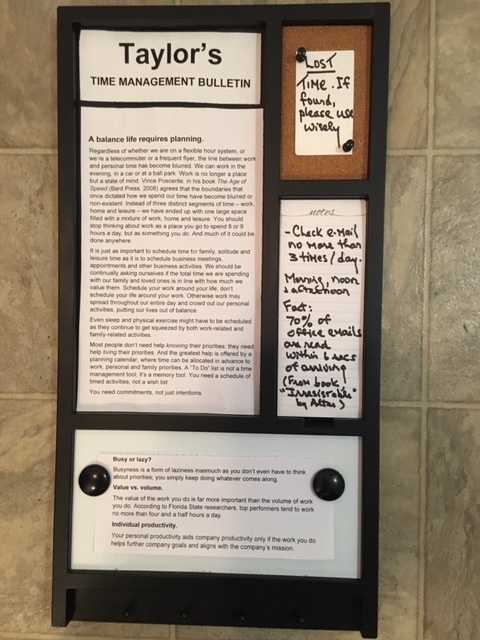 The solution to these problems is not to throw up your hands and refuse to schedule anything for fear of having to postpone it, but rather to limit the number of tasks and activities that you schedule in your planner in any particular week. Most people underestimate the actual time it takes to complete a task. So allowing up to 50% more time than you think the task will take is not unreasonable. Of course that will leave even less time to get everything done. So don’t plan to get everything done. Choose only the most important items – giving priority to those that are urgent as well as important. Don’t block off all the available time in your work week. Block off anywhere from 20% to 80% of the available time, depending on the nature of your job. This not only allows for real crises and emergencies that are even more important than those you have already scheduled; it also allows time in the same week to reschedule any original priorities that may have had to be displaced in the process. Assuming that only about half the available time in a workweek has been blocked off for appointments with yourself to get the really important things done, you may also be forced to schedule some of the jobs up to two weeks or more into the future. This makes it easier to make decisions when asked to commit time to work on additional tasks or to attend unplanned events or whatever. We tend to think we will have more time in the future than we have now. This simply is not true. The easiest way to say no is to have a reason to say no – by seeing future commitments already scheduled in your planner. What about all the tasks that are not considered top priorities, but still have to be done? Add those to your To Do list; but make sure the list is a part of your planner, not a separate sheet of paper or electronic device. Your planner should list your goals, personal policies, To Do list and your actual schedule for the next week or more. These items are worked on during those snippets of time still remaining after having completed the scheduled tasks, and after any emergencies, and additional urgent priorities that cropped up during the week had been handled. If there is no such time left over, you must adjust the amount of time being allowed for the individual tasks or lower the percentage of your total week being allocated to current tasks. Here is a summary of the essentials of effective planning using a planning calendar. 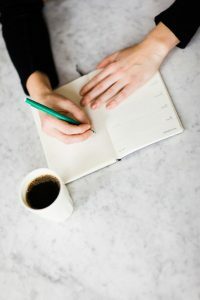 Remember that items on a To Do list represent your intentions; but time actually blocked off in your planner to work on these items represent your commitment to get them done. Trying to focus on any project or task for too long a period of time depletes your energy, decreases efficiency, makes you more prone to error, and increases the likelihood of interruptions. Work on longer projects in blocks of time of 90 minutes or less with breaks in between. Always allow more time than you think the task will take to allow for any interruptions. You can use any time left over to work on your To Do list items. Don’t schedule your whole week. How many items you schedule depends on the nature of your job and your experience to date. If in doubt, test this strategy by scheduling only one or two items initially. If successful, gradually increase the number. Schedule time for only your top priorities, with the more urgent ones scheduled earlier in the week. Everything else can be added to your To Do list and crossed off when they’re done. But don’t spend time on To Do items if there are scheduled priority items still to be done. Only reschedule your priorities if items of even greater importance and urgency crop up in the meantime. Never postpone items simply because they can be delayed. Be prepared to say no. Have as much respect for your time as you have for other people’s time. Schedule both business-related and family and personal items in the same planner to avoid any conflicts. At the end of the year your planner will look like a journal your activities and accomplishments. 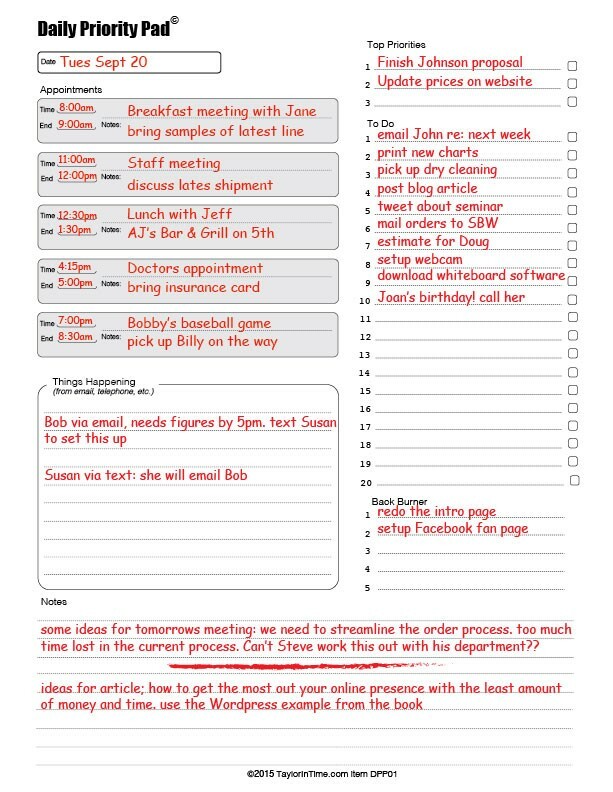 If you feel comfortable using a paper planner, take a look at the Taylor Planner described at taylorintime.com. It has the features needed to maintain control of your time by making commits to get things done.